Project-based learning for K-12 students received a boost with two new story-telling applications from Adobe and Microsoft. Both products are available at no charge. Adobe Voice can be downloaded from the iTunes store for iPad 2 or later running iOS 7 or higher. Microsoft Office Mix is available as a PowerPoint add-in from Microsoft for any device running Windows 7 or later, Office 2013 (or Office 365). Both applets offer rich collections of artwork elements to create and edit a short multimedia-rich project. Both simplify document sharing by providing cloud space for posting on the Web. If you already work with PowerPoint, Office Mix provides additional Ribbon tools (see MixRibbon Tools) to enhance presentation delivery with options that make slides interactive, mixing in audio recordings, quizzes, polls, and video clips to demonstrate a point. Users can record themselves giving the presentation, reposition and resize slide elements, re-record a slide until it’s perfect, and write on a slide for emphasis. Office Mix also offers special analytical assessment tools, enabling those who create a Mix-enhanced presentation to see who watched the show, how well viewers did on the quizzes, and how long they viewed a particular slide. The Office Mix Add-in is still a beta product with glitches. For example, clicking the Insert Quizzes and Video Apps option on the Mix Ribbon brought up an error messages telling me I could not connect to the App Store Catalog. As a workaround, I had to click Store on the Ribbon’s Insert tab, search for free Quizzes and Polls and download each one individually (see Lab Apps for Office below). Additionally, it’s important to create a blank slide before adding a quiz or poll so as not to cover up content on an existing slide. Finally, during project creation, pressing Continue to advance to the next slide works with all slides except the slide with a quiz or poll. “Continue” is currently supported only when the project is published to Office Mix. If you use Office Mix on a desktop computer, keep a microphone and Webcam ready for voice recording and to insert a picture-in-slide video of the presenter. Adobe Voice lacks both the interactive and analytic features of Microsoft Office Mix. But story creation is a simple procedure that proceeds without glitches. An uncluttered interface guides users through the process of creating multi-page multimedia rich stories. Voiced recordings made with the iPad’s built-in microphone and music can be inserted on every page. Users can also add graphic icons, photos, and other artwork for visual impact. Teachers can incorporate Adobe Voice and Office Mix into K-12 core curriculum instruction. Schools that have the required hardware and software (iPads and iOS7 for Adobe Voice; Windows 7 or higher with Office 2013 or Office 365 for Office Mix) can download and install either application. You must sign in to the Microsoft Office Mix site with a Microsoft individual or organizational account or a Google or Facebook account before downloading and installing Office Mix. Adobe Voice downloads through the iTunes Store with an Apple ID. Web tutorials are available for both applets. For Office Mix, visit https://mix.office.com/WatchList/HowTo to learn how to create a basic recording, insert a Multiple Choice, True/False or Free Response quiz (complete with hints and feedback), insert a Multiple Response Poll, upload and share finished presentations, and view quiz analytics. Adobe Voice offers a “getting started” instructional video right in the app on the iPad to explain what the app does and how to make a short video. First-time users of Adobe Voice can also visit Adobe Education Exchange for a Quick Tour and a free workshop. Working with Adobe Voice is a very intuitive process. Simply launch the app, tap Create a New Story, enter a title for the video (optional), and choose a particular story structure (e.g., follow a hero’s journey, teach a lesson, or share a growth moment). Guided instruction helps you get started. App prompts instruct you to press the Record button to record the first line of your story. Talk for a few seconds, then press Stop. Listen to your recording and re-record, if necessary. Next, select an image or icon for the idea just recorded. If you don’t want to use your own visual you can select one from the many Adobe provides. When you’re ready to move on to the next page, swipe to the left and repeat the process. Select a layout and some music for background, then let the app complete the project, weaving all of your page recordings into a dynamic story for sharing online. Sharing choices include Public or Private, Facebook, Twitter, Email, Message, or Copy Link to share with only the people who know the URL (see below). Working with Office Mix is a bit problematic because of the technical hiccups, but well worth the effort. If you already know PowerPoint, you won’t find it difficult to explore the new options on the Mix ribbon bar, but Adding voice and interactive quizzes to PowerPoint slides is not as intuitive as creating a digital story in Adobe Voice. A few quick trips to the Office Mix online tutorial Web site will prove useful. 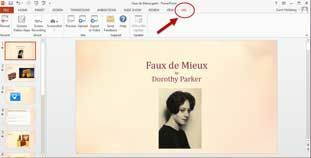 You can create a Mix presentation the same way as a conventional PowerPoint slideshow, working with both the regular PowerPoint tools and the new tools available on the Office Mix ribbon. Start by selecting a presentation template. Then build the contents, one slide at a time. If you click Insert/Online Images to insert a Web-based image, Microsoft provides access to thousands of clip art images, royalty-free photos and illustrations from Office.Com. Similarly, Adobe Voice V1.1 comes with over 25,000 icons, over 100,000 images, plus a library of music clips and animations. Office Mix lets you add screen recordings and screenshots to a slide. Adobe Voice lets you add screenshots but not screen recordings. Voice also lets you add music selected from program offerings or your own collection. An Office Mix presentation cannot contain music (https://mix.office.com/watch/rp7oqeekhn6y). Both apps let you re-record spoken segments as often as necessary, even after publishing. Adobe Voice and Office Mix can help students develop communication skills through activities that include reading aloud, reporting, presenting, and peer teaching. If you require students to provide feedback on the projects created, they will learn to "adapt their communication in relation to audience, task, purpose, and discipline." Ideas for using these apps with students include explaining the big idea of a primary source document or how to solve a real-world math problem (Jones, http://edex.adobe.com/discussion/64c98463/), recording a lesson for someone absent “flipped” instruction, or individualized learning, introducing rational exponents in Math, teaching about climate change or Ohm’s Law I Physics or promoting a social cause. When Adobe Voice creates a presentation, it inserts media credits and source citations on the last page of the story. In Microsoft Mix, the person creating the presentation must cite sources manually. Both Adobe Voice and Office Mix can help strengthen student communication skills, reinforce classroom instruction, and address student interests in engaging ways. Each tool has useful content creation features and each app has tools the other lacks. Adobe Voice has a much more polished look and feel that takes advantage of the iPad microphone and Adobe media to facilitate project creation. Users create multimedia-rich stories with just a few simple taps and clicks. Finished stories with their pictures, voiced recording and music elements save to the Adobe Voice Web site. There are no options to save a story for viewing offline. Office Mix leverages PowerPoint 2013 or Office 365 and supports the creation of multimedia interactive slideshows. When you upload a finished project to the Web, Microsoft prepares the presentation for video presentation, letting you know if any slides contain an unsupported element. After you fix the problem, Office Mix revalidates the presentation. If there are no further problems it will save your show to the Office Mix cloud. Before uploading users can check a box that directs the program to create a video version for offline viewing in addition to a presentation for online viewing. Like Adobe Voice, Mix users determine if the presentation is public, private, or shared with anyone who has the project’s Web URL. 1. Available at no charge if your school has compatible hardware and software. 2. Both tools help students develop presentation and communication skills. 3. Users can share content easily with others by posting their work online.